The company utilizes expert tradesmen, most with over 30 years of experience in their specific trade. It has earned a great reputation in all of the suburbs for its exceptional performance and craftsmanship in all of its remodeling projects and its ability to get a job done quickly and within budget. 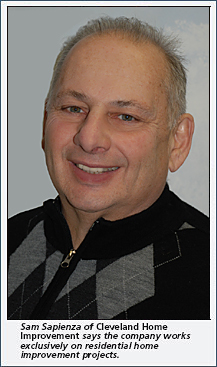 Mr. Sapienza is a third-generation home improvement contractor. His grandfather, Sam Arcara, began in the home improvement field in the 1930s and was followed by his father, Robert Sapienza. Four of his brothers are also home improvement tradesmen. His family’s construction business was one of the first to register with the Better Business Bureau. From a structural standpoint, he has lowered floors, raised houses, and lifted roofs to increase head room and improve the homeowner’s living space. He has helped homeowners lower their heating and cooling expense with the latest in thermal name-brand windows. He has also incorporated some of the newest products and technologies into his business such as the colored stamped concrete, which is the newest in decorative concrete surfacing for driveways, sidewalks and patios. 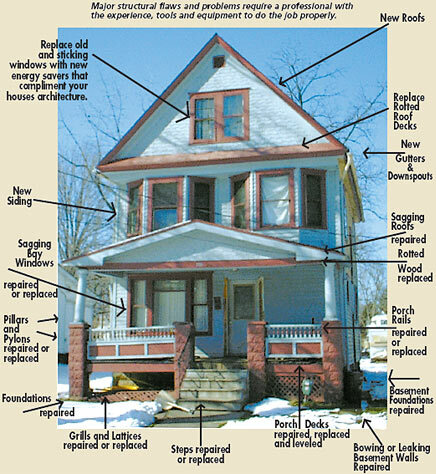 Cleveland Home Improvement is committed to helping customers solve their home improvement problems. The company is licensed, bonded and insured and guarantees the quality of its work to ensure complete customer satisfaction. References and free estimates are available. Call Cleveland Home Improvement at (440) 871-5780 to find out how Mr. Sapienza can help you improve the look of your home with comprehensive, expert remodeling services.